Life is impossible without plants; they are the essential source for human well-being. People who love nature knows the importance of growing trees and plants. The art of growing plants is proven to be a stress reliever both physically and mentally. A garden in every house is highly impossible nowadays due to lack of landscapes. Gardening in balcony is the wise choice to make it happen. These simple ideas help in making your balcony garden look and feel like heaven on earth. Plants and flowers are the main attraction of any garden, the style, shape and colors of the planter baskets makes it more attractive. These self-watering planters come in different shapes with a high gloss finish and is easy to install with reduced maintenance. Choose to plant bright flowers to bring a lively visual refreshment. These colorful railing planters will create an astonishing effect to your balcony. The popularity of hanging baskets have increased nowadays among young gardeners, because it’s a trendy choice for effortless gardening. Always pick sun loving flowers like Petunias, Marigolds, Geraniums for hanging baskets. Never miss to observe the beauty of the hanging flowers to get instant relaxation which is vital for ensuring health and well-being. 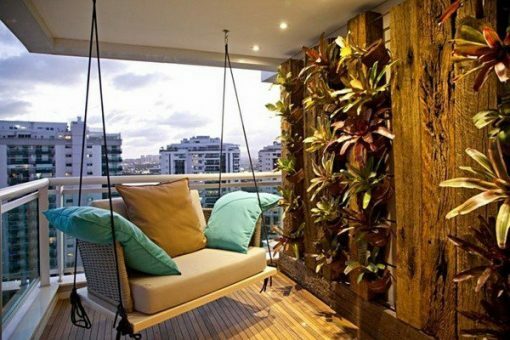 A vertical garden wall is space saving and will work fine on a balcony. Croton, wedding wine, wax flowers are popular choices for vertical gardening. Adds a lot of color on your wall, gives great fragrance, can be easily coaxed into growing along definite direction on your wall. Create a loving living wall for yourself with these vertical wall planters. Choice of planter pots play an important role in highlighting the beauty of your balcony. Traditional clay pots are common and affordable. To bring in stunning looks, always choose modern pots made of Granite, Graphite, aluminum, Marble, solar illuminated pots, stylish colorful ones and also customized planters to suit the style of your balcony. Join hands with your children to create an innovative magical fairy garden. Allow them to experience gardening and create their own pretty little natural space in the balcony. Add some miniature flowers and ornamental grass to create an imaginary forest like the broken pot fairy. Decorate it with fairy houses, ponds, trees, furniture sets and a lot more endless styles. Change the fairy accessories seasonally for a décor change and have fun. Outdoors with green plants boost the effect of exercise and yoga, choosing a Buddha statue is good for meditation and also gives positive energy. Statues are great additions which gives a divine look to your balcony. Also try this colorful kids special gardening duck statue, fake birds and planter heads and create a bird friendly atmosphere in your balcony. Corners are always best for fountains and mini-ponds. The subtle sound of water creates a soothing touch to relax around. Table top, portable and ceramic fountains with mild lighting are best for balconies. Create a wow effect and feel the pure love of nature. Dress up your balcony floor with wood and pebbles to stay close to nature always. Create a floating lawn by packing every inch of your balcony with artificial grass. Enjoy a relaxed, soft and friendly ambiance with these beautiful surface ideas in your balcony. These framed structures covered with transparent material provides controlled environmental conditions for growing vegetable and flower crops. Make a mini kitchen garden, grow herbs and veggies on your own for delicious, healthy meals. This green house is compact and easily fits anywhere in your balcony. Just give a breathtaking look to your balcony by growing Bonsai. The miniature trees with fruits and flowers will undoubtedly amaze everyone. Choose semi-shade loving plants and let your balcony burst with greenery. A balcony garden can be a retreat for people who prefer and love secluded spots to enjoy. Experience fresh air around which makes you calm and relaxed giving a sense of well-being. Plants are proven to enhance cognitive functions by improving concentration and memory. Spend quality time with your kids in this stress-free zone, plan a surprise candle light dinner for your partner and treasure your best moments for life time. Implement these useful balcony garden ideas to bring home the gift of nature. Love nature and live life to its fullest…. Final Garden tips now Summer is here.